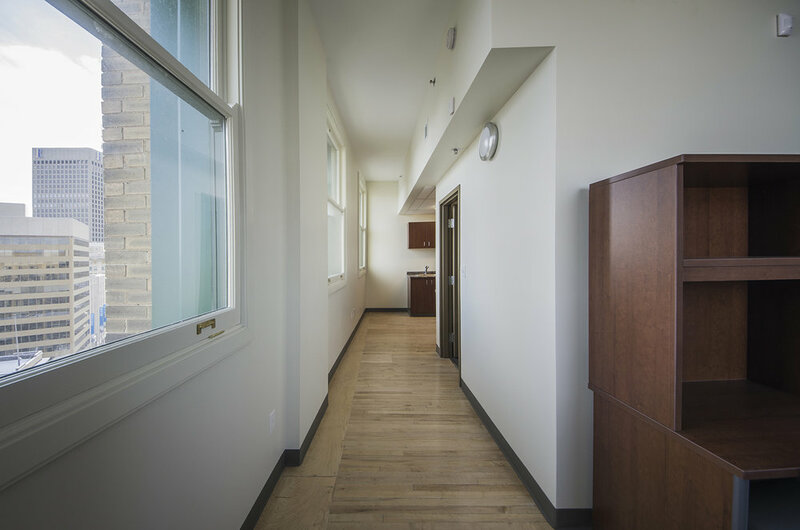 Red River College Culinary Arts & Student Housing | prairie architects inc. The Paterson Global Foods Institute, formerly the Union Bank Tower, is located in Winnipeg’s Historic Exchange District. The original Union Bank Tower was constructed in 1906, designed by Frank Darling and John Andrew Pearson. The Annex was added in 1920. At the time of construction the 10 storey building was Winnipeg’s first skyscraper built in the Chicago Style, its tallest building, and the tallest steel structure in the dominion. It was designated a Class 1 National Historic site in 1996. The exterior is masonry, with terra cotta details and a terra cotta façade and balcony up to the third floor. The terra cotta interior fire protection represented innovative building safety for the period. The building has majestic 28 foot high plaster ceilings decorated with regionally adapted classical motifs. 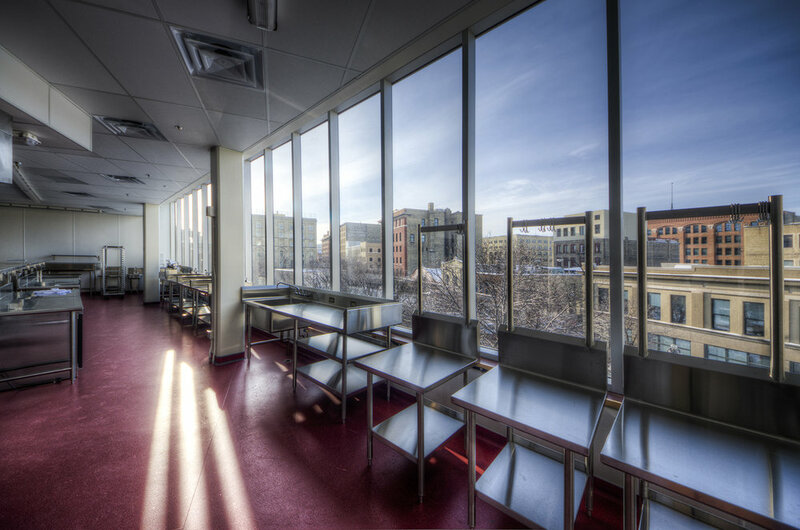 After closing its doors as a bank and office tower in the late eighties, it sat empty for almost twenty years until 2009, when Red River College took ownership to be developed as cooking labs, classrooms and RRC’s first student residence. 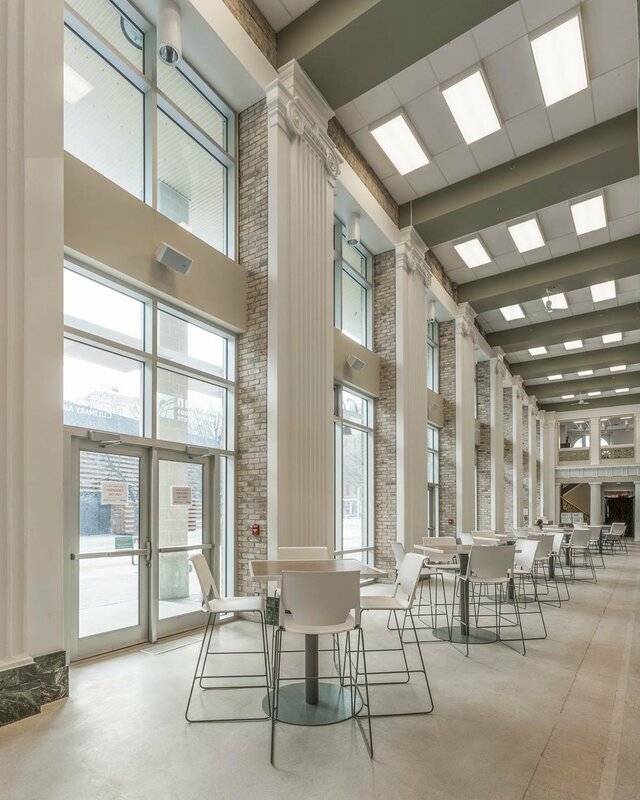 The planned renovation being part of its strategy to expand its downtown campus, and continue its commitment to urban renewal and the restoration of Winnipeg’s heritage building stock, the first being the Princess Street campus. In 2013 RRC’s School of Hospitality and Culinary Arts opened in the addition, with 104 student housing units in the fourth to tenth floors of the tower. As part of the renovation of the tower, both the exterior and interior of the Main Floor Banking hall were restored. Noteworthy features that have undergone rehabilitation include the restoration of the Banking Hall’s 28 foot ornate plaster ceilings, scagliola columns have been finished to match the original plaster colouration, historical colour schemes discovered during cryo blasting were recreated, marble floors, column bases, and wall bases have been restored to original finish, and gilded details were recreated. The repair and replacement of the Terra cotta exterior, terra cotta balcony, foundations, historic annex colonnade and plaster pilasters, hardwood floor restoration throughout tower floors, marble floors including all tower levels and annex floor, historic marble stair, marble elevator lobby, and the re-purposing of marble panels salvaged from building complete the restoration of the structures. 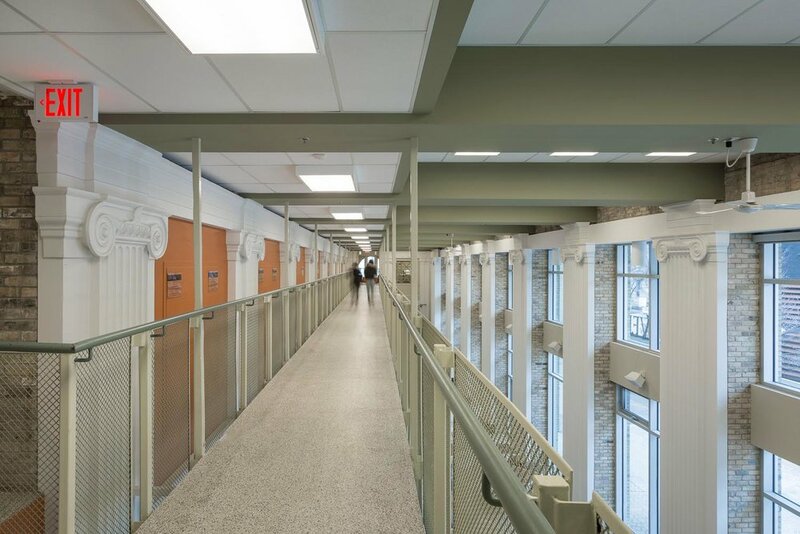 The existing marble corridors on the upper floors were restored and the new layouts planned around their re-use, with the existing hardwood floors in the student suites were sanded and refinished. The building envelope has also been upgraded with a specially designed spray insulation system that conserves energy but allows enough heat to migrate into the masonry wall system. This will allow the brick to dry and prevent moisture damage that may otherwise occur. Notably the building was designed to be a sustainable facility targeting LEED® Gold certification. The addition houses the bulk of the mechanical and lab equipment that has been designed to recycle cooking lab energy that would normally be discarded. Waste heat from the refrigeration systems is also captured to heat domestic water and the pumps that heat and cool the student residence. A new mechanical system and renovated envelope help to achieve a target of 47% energy cost savings over the MNECB. Window sashes were milled to accept dual pane, low-E glazing units and re-installed as hopper style windows to increase thermal performance, for ease of operation, and provide fresh air to occupants. Adaptive re-use in a dense urban core, a green roof over the annex, targeted 44% water use reduction with low flow fixtures, waste management during construction, and the use of materials with low VOC’s, and recycled content also contribute to the sustainability of the facility. Check out Red River College's video on Campus living!